Will You Buy the Dip in Venture Capital? 2017 was a pretty incredible year for most investors. A wide range of asset classes, including stocks, bonds and commodities, finished the year with big gains. But as you can see from this week’s chart, there’s one asset class that shrank significantly: startup equity. 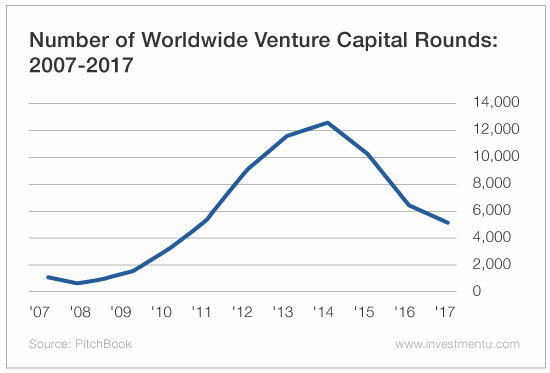 The number of venture capital rounds has plummeted 56% from its peak three years ago. Cash infusions have also declined (although less dramatically) by double digits. As a result, seed- and early-stage startups have had an increasingly hard time securing funding from venture capitalists (VCs). This “startup bear market” has major ramifications for the tech and financial sectors, creating incredible entry opportunities for investors like you. Yet it’s largely gone unnoticed by the public. There are a number of factors at play in the recent decline in startup investments. This era also ushered in the dawn of the “unicorn” - Silicon Valley slang for the extremely rare multibillion-dollar startup. Unicorn success stories like Uber and Snapchat (NYSE: SNAP) inspired entrepreneurs and investors alike to bet big on high-risk, high-reward ideas. But this euphoria didn’t last. Snapchat has shed almost 40% of its value since its highly anticipated initial public offering. Uber has been rocked by intense infighting and high turnover among its executives, as well as widespread allegations of workplace harassment. The recent slide in venture capital activity has an upside: It’s making startup investment opportunities more available to regular folks like you and me. As VC funding dries up, some entrepreneurs are turning to the cryptocurrency world to raise money, holding initial coin offerings (ICOs) or offering digital tokens (redeemable for cash or products and services) to early investors. According to TechCrunch, traditional financial technology, or fintech, funding activity has dropped nearly 10% since 2014. This year the drop will be even more pronounced. That’s because exciting new fintech technology is centered on the blockchain. We think it has immense upside. But much of the raising is done outside traditional venture capital channels via initial coin offerings. And Andy would know. Along with his business partner Adam Sharp, Andy recently launched a groundbreaking new research service devoted to bringing subscribers the best ICO and cryptocurrency investment opportunities. Click here to learn more.